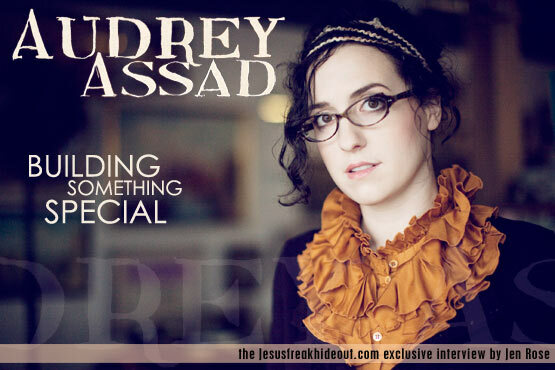 With just a couple days until the release of her national debut release, The House You're Building, Jesusfreakhideout.com's Jen Rose sat down with Sparrow Records' newcomer Audrey Assad to talk about the new album, song writing, her inspirations, and perfecting the potato salad. This interview took place on: 7/10/10. Audrey Assad: Well... yeah, I am. In terms of being on the label circuit and everything. But I'm Audrey, and I hail from Phoenix now, but I grew up in New Jersey. I lived there until I was 18 years old... moved to Florida, so I lived in Florida for six years. Then Nashville, and now Arizona. So I've kinda been working my way around the country... the northwest is next, I guess. Then the midwest and northeast and then I'll be all the way around. I've been playing piano and singing for my whole life, and since I was 19, I've been writing songs. So it's been eight years now doing that, but I've only been making records with Sparrow -- this is my first album with them, so I'm relatively new in the sense that I've never put a label release out before. JFH (Jen): What was the first thing you recorded? Audrey: Yeah, those were some of the first songs I ever wrote! I didn't know anything about song writing back then. It was just what came to me naturally. Which is good, but I had no idea how to refine those things. So they were not... the best... *laugh* That's for sure. JFH (Jen): So you've been playing piano all your life... was music a big part of your family growing up? Audrey: Yeah. Well, my mom's side of the family is all musical... my dad can't really sing at all. *Jen laughs* He just sorta sings loud and that's about it. So I didn't get it from him, although we have a lot of music on his side. Like, my cousins on his side are all musical. I don't know where they get it from -- I don't know where any of us get it from my dad, but my mom is from the South and her whole family, like generations and generations back -- everybody plays and sings. Most of them have never taken a lesson. They just kinda learn by ear, which is how I started playing. I played by myself from age two to six on piano, just playing songs that I heard and replicating them. So again, yeah, from my mom for sure. She plays and sings and everything. JFH (Jen): What kind of music did you listen to growing up that you consider influences on you today? Audrey: Well, my mom is again, probably one of the biggest channels of all that. She raised me on mostly 1970's music... Simon and Garfunkel, Carpenters, Journey. They're sorta more like late seventies / early eighties. The Eagles, Fleetwood Mac, and then Celine Dion, which is so funny, because she's so not related to that at all. But I still have like almost every Celine Dion record ever made. And I don't think I sound anything like her or write anything like her songs, but whatever. We listened to her a lot growing up. And then my dad is from the Middle East, so we listened to a lot of Middle Eastern and French music as kids too. So I just love to sing in French. I never really get a chance to do it unless I'm babysitting French kids, which actually happened. I can read to them in French and sing to them in French and it's fun. JFH (Jen): Hmmm... maybe in the future you can include a French song on a record! Audrey: I'd love to! One day... probably a lullaby. I really want to do a lullaby record at some point. I've written quite a few of them. It'd be cool to have a French song and maybe an Arabic song on there... just kinda some different things. JFH (Jen): So how would you describe your new record The House You're Building? Audrey: I think I would describe it as musically, in some ways, a combination of a lot of those influences I've mentioned, especially the 1970s influences. There's some 80s in there too actually... I feel like I live between the 70s and the 90s. My music is not trendy I don't think... (Jen: Mainstream...) Yeah... the record is not technically an acoustic record, but I write songs acoustically, and so there are some of the songs on there that have more electronic elements. But the core of it is very singer/songwriter, very 1970s to 1990s female singer/songwriter kinda stuff. The production has made it fresh, but I think the songs have a nod backwards there. And lyrically, it's really almost all vertical in terms of first person to God. Most of my songs are. I don't know why, but they just are. I hardly ever write corporate worship on my stuff. "Restless" is the exception to that, but even though the other songs are not really made for corporate worship, they're still kinda vertical in their direction. I like to use imagery a lot. Nature... "The House You're Building" is about a house but it's talking about the church, so there's a lot of lyrics using images like that, and metaphors. Audrey: Yeah, it is more vertical... honestly, people always ask me if that's on purpose, and it's not. I write a lot for other people's records, and sometimes we write all kinds of songs... love songs and sad songs and whatever. But it just seems like, for me, when I'm writing, that's the most natural thing. I have an easier time writing songs to God than about him, y'know? I didn't really notice it until this record came out. JFH (Jen): Another thing I noticed is a theme in "The House You're Building," and there was another song -- I can't think of it off the top of my head -- but there's this theme of being an outsider or a misfit... was that an intentional theme or is that another thing that just comes out? Audrey: No, but it did influence, I think, the development... Some kids go to middle school, and they just try really hard to fit in, and that's all they wanna do. Y'know, it's just, "I wanna be accepted. I wanna be cool. I want people to leave me alone." And for me, I know that I just threw myself even harder and harder into school, into reading, into music as well... instead of trying to be like them. I had a few really close friends. I mean very few -- like two. *laughs* So I had a couple of friends that I was just really close with, and then for the most part, I studied, and I didn't write music back then, but played in band and all that stuff. And so I think at that point, my identity became about the things I was good at. Now "the house you're building" in that song is about identity being that God loves me. It doesn't make sense sentence structure-wise -- like "Who am I? Well God loves me, that's who I am." It's not really a Western way of thinking. That's very Eastern in its spirituality. And I think it's what I've realized - that it's not even the things I'm good at that are who I am. It's what God says about me, that's who I am. So, really, the simplest way to boil that down is "God loves me and that's who I am." So that's kind of what that song's about, which is basically, "yes, I am a misfit, yes, I feel like an oddball, and yes, I struggle with this or that, but at the end of the day, God is using me in the church now because of who I am and who he created me to be." Even with my sin, which makes me unfit for use sometimes in a sense, He shapes us as we grow. He doesn't wait 'til we fit and then put us in. It's just that way. JFH (Jen): What is the story or inspiration behind "For Love of You"? Audrey: Oh, that is from a poem I read by Hopkins... Gerard Manley Hopkins is his name, and he's becoming a favorite of mine now. At the time, I was relatively familiar with him, but I hadn't read a ton of his work. But this poem is about kingfishers - these birds - and it's called "As Kingfishers Catch Fire." So the whole first half of the poem is about birds and nature and y'know, all these really strong images, and all of a sudden he says this line, "For Christ plays in ten thousand places / Lovely in limbs and lovely in eyes not His / To the Father through the features of men's faces." So he uses all this nature imagery, and then all of a sudden it becomes about Christ, and you realize he's been talking about Him the entire time. Which is to say that not only in the creation around us do we see Him kind of reflecting and glimmering and... I always think of Him as winking at me in the sunlight. It's just I feel that He is, well, like I said, playing "in ten thousand places." And then it talks about limbs and eyes that don't belong to Him, but yet He's there looking at us, y'know? And He's not only looking at us, but He's playing to the Father through our own features. Like this is Christ glorifying God through us just because of what we look like and who we are. So that's where that song came from. I talk a lot about God being in a million places in the verse, and then the chorus is like, instead of talking about nature worshipping God, I compare myself to a sky on fire. So it really kind of all sprung from Hopkins saying that Christ is looking at us from everywhere if we just open our eyes. JFH (Jen): What was the biggest thing you learned in the process of making this album? Audrey: Hmm... what can I say... there's so many. I guess, for me, making this record with the guys that I made it with. Almost none of the people who worked on this record have the same religious beliefs I do. Only one I think, as far as on the musical end. And that was really an incredible experience because, first of all, it made me really ask myself if my songs were any good, from an objective, musical standpoint. Am I doing this with excellence? Like, am I making good music? Because really, that is just as much an act of worship as any lyric you'll ever write. You don't wanna just say, "Well, my message is there. I don't have to work hard at making my songs good." And so that was a good reminder for me. When we were in the studio with these guys who played with these huge European artists, and they're playing these songs, and I'm thinking... are they thinking to themselves, "I can't believe I'm playing this crap" y'know? It made me second guess, but in a good way. Like, am I writing good songs? Am I being a good steward of this gift for writing that I have? And am I taking shortcuts? I won't do that. So that was a big deal. And then seeing them connect with the music..
Madeleine L'Engle is another favorite author of mine. She wrote A Wrinkle in Time... (Jen: Aw, I love her...) Yeah she's awesome! She wrote this book called Walking on Water: Reflections on Faith and Art, and it's amazing. Every artist, every writer... everybody should read this book. She talks about how any piece of good art is a small incarnation of God in some way. Meaning that because Christ came to earth and became physically human and God became human, He left a stamp on everything that is good here. And that... how do I put this? Any beautiful painting points to Him. Any beautiful song points to Him. Even if the "message" quote-unquote of it is not focused on Him, the very gift that created that song came from Him. So everything points to Christ in this world, especially art, maybe the most obviously, and music. So just experiencing music with people who don't know Him (or don't profess to know Him anyway. I can't know what they profess to.) made me realize how much bigger worship and the reach of God's arm is than the bubble that we all live in sometimes. I think that really taught me a lot. It humbled me a lot. I think I have a tendency like anybody to get caught up in my belief system to the point where I'm not looking around me to see what God is doing elsewhere. So that was very cool for me. JFH (Jen): Yeah... I like to think of art as, whether the artist knows it or not, it's an act of creation. I guess it ties into the creation that God is constantly doing in us. Audrey: Yeah... and if you think about it, I would take it a step further and say its not creation in the sense that it's... we're not making something out of nothing. So what we're doing is, like when we write a song... if I write a song and I make music and I make a melody, I'm really pulling down from something that exists already and rearranging it. And it's the same with art. We paint from what's in our subconscious or what we see with our eyes or what's in our heart. And so it even more so points to God in the sense that you have to wonder where the very raw materials of inspiration even come from in the first place. Why melody? Why music? Why is it there? I mean, I'm not making it. I sing a note, but that note exists without me. Like, I'm not making something up. I'm arranging something from a scale of eight notes. That's something that exists above my ability to create. So it's a whole different ballgame when you start thinking about our role as, like, creative arranger of things that already are. So your Average Joe bass player who is not a Christian, or maybe not even in a believer in anything, is playing music so he is participating in this very uniquely human task of making beautiful things from the raw materials that God has provided. It's really interesting... I'm learning a lot about that, and definitely making the record was huge in that area of teaching me that. JFH (Jen): What is the writing and creative process like for you? Is there sort of a process, do you just get inspired and start, or is it a lot of work? Audrey: I think as I get more and more steeped in this, over the last few years I've seen several processes emerge. There's a lot of times where I write lyrics, and I'll be sitting somewhere, and it's either one sentence or a whole lyric idea or whatever. It might be a whole song top to bottom, but just the words. I do that probably most of the time at this point because I travel so much, so I'm on an airplane or somewhere where I can't, y'know, play anything. So I've taken to writing lyrics and then sometimes even writing melodies in my head. I've written whole songs that way without an instrument at all, without singing it out loud one time. The way I figure is if I can't remember it in an hour it just wasn't any good. So that's one thing I do a lot. The other thing that happens is when I have a writing appointment with someone, we usually start with one shred of an idea, whether it's a lyric or a melody and build the whole thing from scratch at the same time. And then the rare thing that causes songs like "Winter Snow" to happen is when it just literally seems to come from nowhere. I mean, like handed to me and I just sit down at the piano and it just comes in one piece almost. Like I didn't even have to work on it. That's the way "Winter Snow" was. I mean, I didn't even have that idea, it just... literally... happened. Like, came to me. It was really weird. So I've had a few songs that came that way. So I think those are the three. It just depends on the context. I can't control that third one at all. The lyrics thing is the one that I have the most control over cause I just sit there and tweet and think and look at it and move at my own pace. So it's different, different contexts. Audrey: I did! I was 19 when I did that. When I figured out finally, clueless me, that music was what I was supposed to do. As much as I'd played all my life, I just never thought I'd do that for a job or for a ministry or anything, and then when I was 19, I realized that was what God was calling me to. So that was the way I jump-started my songwriting, cause I didn't really know how to write songs. I'd never done it... I tried in high school once or twice and just given up on it cause I just thought they were terrible. *laughs* So I said well, I'll write a song every day for 30 days. I don't care how terrible it sounds as long as I finish it, and I can throw it out and never see it again. I felt like it was like priming a pump of soap when you buy it from the store. That's what I considered that to be. I've done it again over the years with things like poetry... made myself write every day in a certain way so I could try to get the juices flowing. JFH (Jen): Did you keep any of the songs? JFH (Jen): Thinking about women in worship music... there's been an ongoing discussion that there's just not a lot of female artists in Christian music. Do you think that's the case as a woman working with artists like Matt Maher and Chris Tomlin? Is it different? Audrey: I would say that music industry in general is kind of a boys' club right now. Not in a bad way. It's not that I feel like they're not welcoming to girls. But there's so many reasons this could be happening. I have a theory or two about it. I think that part of it is just trend. I mean, in the 90s, female singer-songwriters in the mainstream were huge, and in Christian music. It was just very popular. Lilith Fair was huge. That was the way the market was. So part of it is just... it's trends, y'know? Cause there have been successful women since the time that music first became pop... I think it's always gonna have valleys and peaks. But it is rather remarkable that for the last 10 years there have been relatively no, y'know, top 20... like I read the stats and it's weird. You look at the top 50 songs of the last decade and two of them are women I think? JFH (Jen): Yeah there was an article in Christianity Today about that. Audrey: Yeah, I posted that on my Facebook. A lot of people seemed to think I was trying to make a statement, about like hating men or something. I didn't even comment on it. I said something like, "Wow this is crazy. Read this article." But I just thought the statistics were fascinating! I happen to be very conservative in my beliefs on gender roles within the church. I mean, I'm Catholic, and I don't believe in women priests. So, if there's anybody who isn't anti-masculine leadership, I'm that person. That's where I come from and that's what I believe. At the same time, obviously, I'm out here doing this for a living, so I believe that women have a lot to offer ministry and to the church at large. I think it's interesting that they don't seem to be received very well by the consumers. That's what really fascinates me. And it's sort of like, why wouldn't your average radio listener who tends to be from 30 to 45, your old end female, want to listen to girls? Why do they want to listen to men so much more? I think there's a lot of cultural things behind this trend... I don't know. I don't wanna make assumptions about men. I think that's the fascinating part of it though. Audrey: Yeah. And I gotta say, it's a little intimidating, cause I know that I'm coming into this business at a time when the market is not in my favor... and you know what? It is business. It is ministry, and God's guiding me, but there's also this very big business element to what I'm doing. And the minute you decide to sell your product, your songs, in a sense, you've commercialized yourself. And the sooner we reconcile that, I think, the easier it'll be to navigate that problem, cause it's very difficult with faith-based music to navigate that whole dilemma. But the sooner that I admit to myself that I am selling my product, then I can really like go, "Okay! That's that," and now I do that so I can minister and that's the way I support myself. So anyways, the market being hard for women is a problem in a sense for me. I'm sorta going like, "am I gonna be able to have longevity in this business being a girl?" *laughs* It's kind of a weird thought, but I do think about it... just to try to figure out how to navigate it. JFH (Jen): Yeah, the business and ministry thing all factors into it. Audrey: Yeah, always a problem. But I think the problem's the worst when people won't admit that what they do is business, y'know? I mean, the church, in a physical sense, runs like a business. It intakes money, it outputs money, it does transactions... it's impossible to run almost anything without [it]... unless you're gonna do it the way in Acts 2 where everyone just shares everything and nobody has their own stuff. And there are people who live that way, and that's probably the only way the church will not be a business. But for most people, that's not how it works. And when you deny that it's a business, then you start running the risk of appropriating the funds that are coming in for your own use. That's where it gets hairy. So I think as long as everything is in the open, you're up front about everything, that's the best bet. JFH (Jen): You have all the literary influences in your work... and I'm a book nerd, so I can appreciate that. *laughs* What are you reading right now? Audrey: I am reading several books right now. *mumbles* As usual... because I can't stay on one... unless it's extreeeeemely gripping. And a lot of the books I read, unfortunately, are not extremely gripping because I'm trying to stretch my mind. I'm reading a book by George MacDonald called the Phantastes and it's basically a fairy tale. George MacDonald was a man who C.S. Lewis called his greatest influence. They never met in real life to my knowledge, but he read everything the man had written and so he was always quoting him in books. And like in The Great Divorce, which is my favorite C.S. Lewis book, he meets George MacDonald in Heaven... or wherever this place is they are, there's some debate about it. But he meets him there and he guides him through the latter half of the book. So I decided to start reading George MacDonald because I thought, "well who would influence a man like C.S. Lewis to write the way he did. I'd like to know that guy." So I'm just about a quarter way through it. It's just a fairy tale... it's really neat. It's a lost art. It's kinda wordy, but I can definitely see that C.S. Lewis got a lot from him. I'm reading a lot of C.S. Lewis right now. I mean, I always try to read him, but I particularly am reading Letters to Children. I have so many I haven't read yet, I have a little pile. I know I've started Letters to Children. That's a really great one. JFH (Jen): Are there any other kinds of art that you enjoy making and -- how do I put this? -- other creative outlets besides writing and music? Audrey: Yeah... I love hand lettering... like writing different scripts and fonts and stuff. I used to make my own CD covers before this record. So I would hand do them all, hand letter them all. I love doing that. I like making accessories. I actually started to sell them at my merch table now, like feather hair pieces 'cause I wear them a lot. I decided to start selling those, so that's one thing that I'm making as well. I love drawing... and obviously I like writing, just writing poems and writing essays and things like that. I keep pretty busy with all that stuff. JFH (Jen): What do you like to do when you're not on the road and have some downtime at home? Audrey: I like to cook. I should've listed that as a creative hobby because it really is! I always like to say cooking is the only art form that touches every sense. Your sight, your taste, your touch, your smell, your hearing... so I really do like to cook. I cook all the time. I'm always trying new things, and my thing is to take ingredients and learn how to do a lot of things with them. So I went through an egg phase... I went through a potato phase. I've been through a sauces phase. And I'll still probably return to learn some more, but it's really fun. So I do that when I'm home a lot. And... what else do I do? Y'know read, and... I like TV, but I don't really watch a lot, so when I'm home I usually catch up on the shows that I do like... like 30 Rock and The Office... though I like the British one better. But yeah, and I love movies. I'd say I'm an avid film watcher at this point. I have a huuuuuge list that I'm trying to knock out, but because of Netflix, now I can do it! I'm trying to knock out a bunch of classic movies and things that I've just never seen. Some of them I don't really wanna watch, but I feel like I should see them. I'm like, this is something that the culture sees as pivotal, so I'm gonna try to watch it *laughs* just to know it and try to be well-versed in those things. And so that's something I do with a lot of my time too... maybe too much of my time. JFH (Jen): What are some of your favorite movies? JFH (Jen): I was gonna ask about the cooking... what is your absolute favorite thing to cook? JFH (Jen): It's your signature. "Hey Audrey, bring the potato salad!" Audrey: Yeah! That's one thing. That and this one thing that people are starting to ask me to bring is I make this Mexican street corn sauce that you make grilled corn and then put it on and it's sooo good. That's another thing I make a lot. (Jen: Oooooh... you're making me hungry.) I like it. JFH (Jen): What has God been teaching you lately? Audrey: Discipline. I already know that one. *laughs* Big time, big time... I mean, in so many areas. Working out is something I've been doing almost every day for forty days now, and that's something I've almost never done in my life. Never exercised really beyond what I would just do on a daily basis, and I started to actually feel convicted about it, because not only do I need to be healthier, but it's just silly that I would spend so much time sitting, and reading even, and watching movies when I really should make sure that I'm doing something hard. The thing is, you can't grow as a person without challenging yourself, and I've started to realize this. That the working out is about being healthy, but it's also about stretching yourself to do things that are hard for you 'cause it's good for you. And I think I'm starting to realize why my parents would want me to do things that were hard for me. Like I need this, I need to do stuff I don't wanna do just to be a better person and grow my character and grow my endurance, y'know. So exercise is one way I've been learning that. Prayer has definitely improved since I started working out. It's so funny. Like, big time improved. So that's another thing. Like, when I'm home and I'm off, I barely ever sleep in anymore. I used to do that because I would think I would feel better, but then I realized I just felt worse because I didn't do anything with my time. So I started getting up early most of the time when I'm home and working out or cooking or doing things. So this whole idea of discipline and self-denial has been big for me lately, and I'm really growing because of it. I'm seeing a huge difference in my spiritual walk and my physical life. JFH (Jen): Any last thoughts or comments? Audrey: Oh, I've talked so much... *laughs* Umm... well, you didn't ask this, you don't need to, but I will share it because I think it's important, especially for teenagers who wanna be musicians and singers and songwriters 'cause I know that's one of the questions I get asked the most by kids... "How can I do what you do?" And I don't really have an answer for that question in a sense because it's just different for everybody. For me it was very organic. I never really had a strategy, so I don't really know the way to like "get there." But as far as writing, I just wanna encourage people because I think writing and reading seem to be such a lost art now. It's just not what people do with their time. It's so sad. I mean I'm just sad about it. Not only the reading part... that's sad enough that we don't read. But I think what makes me the most sad... I think not loving reading is a symptom of a deeper issue which is we don't love words. And I don't think we honor words anymore. It's like they're just tools... they're not pieces of art themselves. If you look at a letter... I mean, a letter is a beautiful thing! It's got curves and lines and it's well-designed, you know? That's why people who love typography are so... I love it! Cause like it is a whole art form to them, of making different letters and fonts and all that stuff. But anyway, I think we should love words, and I think we should steward words, and I think that writing and reading them is very important. So to be a good songwriter you have to really love words, and you have to love them enough to read. That's why a lot of songs sound the same now. We just don't read anything! How are you gonna write something transcendent if you don't read anything transcendent? How are you going to do that? It's just not likely at all. I'm not holding myself up as a standard for that, but I will say this... that is what I want, to write something iconic and lasting. And the only way I can do that is if I consume that kind of stuff. The only way I can produce that is if I'm intaking that. And that's the only chance of making something people will remember. Audrey: Yes, there are! Many reasons... and so that's always been my advice to aspiring artists. Consume good things, and you'll make good stuff. Audrey Assad' new album The House You're Building is available now!